Occasionally, very occasionally, music delivers a transitory release from the things in life that we find perplexing or unbearable. In an instant it can make the world look and feel a very different place. 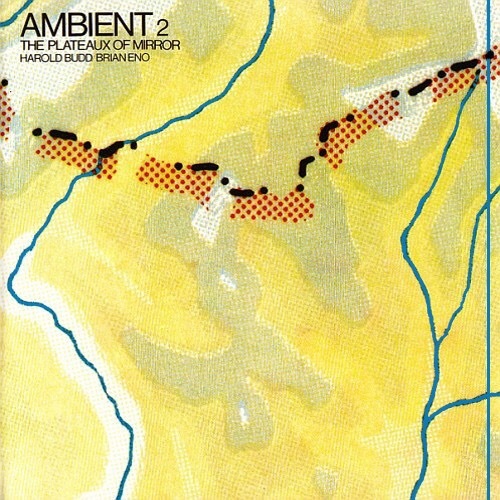 Ambient 2: The Plateaux Of Mirror by Brian Eno and Harold Budd is one of those records. Unremarkable to many, perhaps as much for the contrast it provides with Eno’s more immediately gratifying post-Roxy output as for its sonically supine disposition (try hearing it out after a hard day’s graft), Plateaux Of Mirror is one of the few records I know of which has the capacity to utterly transport me – not simply to some soporific place of refuge, but to a subconscious realm of half-forgotten memories and fragments of dreams never lived. By 1979, Eno had already demonstrated unmistakable signs of disaffection with staid rock conventions, firstly in his work with Cluster, and in particular, with his inaugural foray into ‘ambient’, Music For Airports. Eno’s recorded output was prolific during this period, yet still struggled to keep pace with his inherently inexhaustible appetite for experimentation with treated and textured sound. Just prior to recording Plateaux Of Mirror in late ’79, he had collaborated on a second album with Cluster’s Moebius and Roedelius and made Music For Films. Before the latter was finished, he was already hatching plans to work alongside Laraaji and Jon Hassell for future releases in his Ambient series. By then Harold Budd had developed a reputation as a highly respected avant-garde pianist and composer. On Plateaux Of Mirror, Eno offered him full range of expression in his utilisation of electric and acoustic piano, while he himself constructed a backdrop of minimalist soundscapes within which Budd could improvise. Together they produced a miraculous minimalist classic, characterised by short pieces such as ‘Steal Away’ – washed out, dissolving in its own timorous flightlessness, and lengthier pieces which to some may sound monotonous upon first hearing, but patiently reveal marvellously disorienting little secrets. For instance, on the album opener ‘First Light’, it takes the best part of six minutes before Budd’s impressionistic sonata cedes to a wash of ascending synth, almost as if suddenly, and very discretely, a trifling little celestial drama has unfolded somewhere in the heavens. It and its reprise ‘Failing Light’ (the closer), have a steady tempo, whereas the gaps in ‘Above Chiangmai’ are wider, the harmonics looser, the playing irregular, creating an atmospheric stillness that is taut and unsettling. It makes Erik Satie sound like Fats Domino. Meanwhile ‘An Arc Of Doves’ resembles something from Eno’s Another Green World, but Budd’s playing is pretty and optimistic. The title track, ‘Plateaux Of Mirror’ possesses these unbearably poignant melodic shifts which – much like the music on Victorialand by The Cocteau Twins (future Budd collaborators) – bring you face to face with childhood memories, real or imagined, the faces of loved ones past and present, beautiful landscapes once observed or perhaps not. Here, it’s capacity to extract from the deep well of the subconscious parallels the work of Boards Of Canada, if not musically, then certainly spiritually. A little incongruous upon first listen is ‘Not Yet Remembered’ – a voiced consonant amongst ariated vowels, it’s sudden increase in volume and utilisation of choral synth make it the most human and earthbound thing on the album. It contrasts sharply with something like ‘The Chill Air’, which barely seems to exist, leading us to doubt whether these sounds are the work of human hands at all. Instead they sound like a strange balancing act of nature. It’s hard to imagine Boards of Canada and similar artists existing without Eno’s work, isn’t it? Enjoyed the filmic final para. Too true. Thanks for the kind comments too.